New Directions Publishing Corporation, 9780811214049, 105pp. Menagerie was Williams's first popular success and launched the brilliant, if somewhat controversial, career of our pre-eminent lyric playwright. Since its premiere in Chicago in 1944, with the legendary Laurette Taylor in the role of Amanda, the play has been the bravura piece for great actresses from Jessica Tandy to Joanne Woodward, and is studied and performed in classrooms and theatres around the world. The Glass Menagerie (in the reading text the author preferred) is now available only in its New Directions Paperbook edition. A new introduction by prominent Williams scholar Robert Bray, editor of The Tennessee Williams Annual Review, reappraises the play more than half a century after it won the New York Drama Critics Circle Award: "More than fifty years after telling his story of a family whose lives form a triangle of quiet desperation, Williams's mellifluous voice still resonates deeply and universally." This edition of The Glass Menagerie also includes Williams's essay on the impact of sudden fame on a struggling writer, "The Catastrophe of Success," as well as a short section of Williams's own "Production Notes." 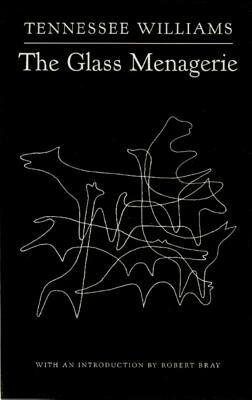 The cover features the classic line drawing by Alvin Lustig, originally done for the 1949 New Directions edition.